Sandia National Laboratories engineer and UNM alumnus Tian Ma, whose research helps deter nuclear proliferation, is the 2016 Most Promising Asian American Engineer of the Year (AAEOY). He will be honored in a ceremony March 12 in New Brunswick, New Jersey. The prestigious AAEOY awards are a National Engineers Week program sponsored by the Chinese Institute of Engineers-USA to salute Asian-American professionals who demonstrate exceptional leadership, technical achievements and public service in science, technology, engineering and math. Past winners have included astronauts, corporate executives and Nobel laureates. Nominees come from a range of industrial, academic, government and scientific institutions. Over the past 12 years, Ma has developed a variety of detection and tracking algorithms for remote-sensing systems that detect and track the movement of objects for the nuclear nonproliferation program at Sandia. Ma has served as the technical lead on several multiyear projects, as well as principal investigator on two Laboratory Directed Research and Development projects. His advances in multiple-hypothesis tracking and jitter suppression algorithms have led to entirely new U.S. government remote sensing missions. Ma’s expertise has led to one issued patent, three pending patents and multiple publications. Ma enjoys the challenges that come with innovation. “For me it is gratifying to solve a problem that no one has solved before. The moment that it hits you when you realize you may have a solution is very exciting,” he said. What makes Ma stand out is his uncommon ability to innovate all along the spectrum from research through to real-world application, said his manager, John Feddema. “Tian is one of those individuals who makes the entire team better by being a role model for creating new technical innovations and ensuring that these technologies transition into applications,” he said. Ma recently completed a Master of Business Administration in Management of Technology from the University of New Mexico, building upon his bachelor’s in computer engineering and master’s in electrical and computer engineering, both from the University of Illinois at Chicago. “At Sandia, I developed a lot of technologies and I wanted to learn how to commercialize them. My motivation to get my MBA was to learn the business side of how to extend our technology into the commercial world,” Ma said. Sandia hired Ma in 2003 through its highly selective Master’s Fellowship Program, which paid his salary and his full graduate tuition. “I am very grateful for what Sandia has done for my education,” Ma said. Sandia National Laboratories engineer and UNM alumnus Tian Ma was named the 2016 Most Promising Asian American Engineer by the Chinese Institute of Engineers-USA. 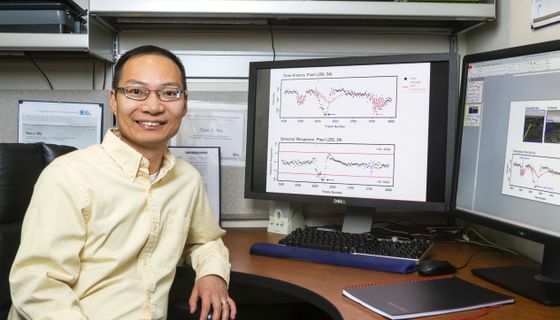 Ma is being recognized for his achievements in developing new tracking algorithms for a class of remote-sensing systems that have enhanced national security. Serving the community is important for Ma and another reason for his AAEOY award. As co-chairman of the mentor committee for the Future City Competition in New Mexico, he pairs Sandia technical mentors with local sixth- and seventh-grade students to help them imagine, design and build models of the cities of the future. Ma also is the former co-chairman of Sandia’s Asian Leadership Outreach Committee. Ma credits his success to his parents and points to the sacrifices they made for his education. Emigrating from Guangzhou, China, to a poor area of Chicago, they abandoned their careers so Ma would have better educational opportunities in the United States. Ma says his biggest inspiration is his dad. “My dad is the smartest person that I’ve encountered in my life. He has a much higher IQ than me. I’ve witnessed him solving many complex problems in our daily lives. However, he grew up during China’s Cultural Revolution where he wasn’t presented with opportunities for higher education. I want to make sure I put into good use the opportunities that my parents helped create,” Ma said. For more information on Ma and Sandia National Labortories contact Rebecca Brock at rabrock@sandia.gov or (505) 844-7772.